Carnation Farms is growing grain thanks to the support of a King Conservation District’s Regional Food System Grant Program. 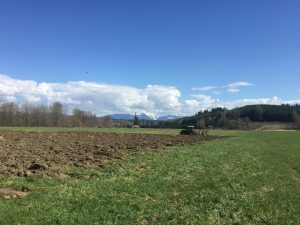 This project will put 20 acres of underutilized farmland into grain production and provide a series of grain-focused classes and events in order to launch a thriving King County grain economy. The project is connecting local farmers including Steel Wheel Farm and Jubilee Farm, distillers, breweries and food business folks around growing and consuming grain crops. One of the most noteworthy expected outcomes of this project is the relationship that will be established with Westland Distillery, Pike Brewing, Lagana Foods, and Grand Central Bakery. These Seattle-based businesses use significant amounts of grain. In addition to yielding grain sales for Carnation Farms, this project will establish partnerships that begin building a network of local grain-users that seek out King-County-grown grains. There will also be a Grain Festival and Dinner to celebrate grain growing in the valley. Carnation Farms is pleased to host Grain By Grain authors Bob Quinn and Liz Carlisle for an event focused on bringing farmers, distillers and bakers together for a discussion about growing grain. Our guest authors will speak about their new book, Grain by Grain: A Quest to Revive Ancient Wheat, Rural Jobs, and Healthy Food and their experiences growing grain in Montana. Carnation Farms is currently working on a project to put 20 acres of underutilized farmland into grain production and provide a series of grain-focused classes and events in order to launch a thriving King County grain economy. The Carnation Farms culinary team will provide grain-based snacks for event attendees. 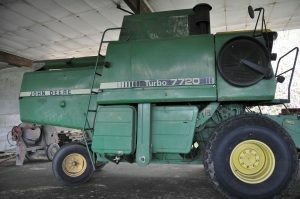 April 15th: The combine arrived! Nothing runs like a deer. March 31st: The field is being plowed and prepared to plant two kinds of grain: Fritzspring Barley seed and Edison-Bow Hard White Spring Wheat from the WSU Bread Lab. Thanks to KCD for supporting this project.